On March 29th, 2015 the well-loved Boulder Creek Brewery was gutted by fire. The building remains, an empty shell, at 13040 Highway 9, the epicenter of Boulder Creek. A “For Sale” sign tacked to the façade has signaled the end of an era for months now. They’re not going to rebuild. Moving to Boulder Creek from Ben Lomond some years ago, refuge and solace was found after tedious upheaval, boxes and belongings, with a late-night plate and a velvety pint. Relative newbies to town at the time, Moe was quick to put us at ease: “No sleep ‘til Brookdale!” he pretend-screamed into an imaginary mic, putting a local twist to the Beastie Boys’ “No Sleep till Brooklyn” and setting the scene for life in our new digs. Hell yes, we could stagger home on foot, and all would be right with the world! What a find, Boulder Creek and its Brewery! Home of original on-site brews such as Dragon’s Breath IPA and Redwood Amber Ale, the Brewery was a hub for wonderful food and good times for local characters and travelers through. After the fire, which is believed to have been sparked by an electrical wiring failure, the heartbeat of a small mountain town was silenced for a few breathless, unbelieving months. The day after the fire, neighbors wandered down in a daze to stand outside the building squinting up at the morning light pouring through where the roof used to be. The brand-new awnings and “Boulder Creek Brewery” sign remained intact as if nothing had happened. For regulars, the ghostly absence of colorful family friendly community gathered together over a solid meal and a tasty pint was deafening. Rarely has an off-the-hook burger, locally brewed beers on tap, and a catch-up on current gossip (and the wedge-cut fries) been more sorely missed. Time heals and the spirit of a mountain town always prevails. A stroke of good fortune after bad allowed the business to move sideways and kitty-corner one block to the just-vacated Boulder Creek Music storefront under the I.O.O.F Hall at 152 Forest Street. For the better part of two years, the Boulder Creek Brewery Outpost kept the vibe alive with locals and visitors alike, stirring up small bites in a clever ‘kitchen-in-a-pinch’ and pouring exceptional guest taps. The lifeblood of a small town again found its course, and on most evenings “The Fishbowl,” as the seating area at the front of the establishment became known, would be bubbling with smiling faces, tall tales, and uproarious laughter. Ben Lomond’s Mountain Community Theater delivers with world-class production now through May 28, 2017. Mountain Community Theater presents the 2013 Tony Award winner for Best Play, Vanya and Sonia and Masha and Spike by Christopher Durang, directed by Peter Gelblum. The production opened at Ben Lomond’s historic Park Hall on Friday, May 5, and continues on weekends through Sunday, May 28. The cast includes: W. Scott Whisler, Daria E. Troxell, Robin Aronson, Correll Barca-Hall, Ashley Sue Perry, and Sasha Voigt. Locals have seen the force of unrelenting nature first hand while making the daily migration to Barbara Day Park to snap photos of the swollen San Lorenzo River surging over the dam. On the other side of the bridge, a lone home clings to its moorings against a moving mountain. On February 7, the hillside behind Kirk and Val Hollen’s Boulder Creek home gave way, taking down trees and boulders and slamming into the back wall of the house. Storm watchers at Junction Park several hundred yards upstream reported hearing the initial rumble of earth set into motion punctuated by the rending crack of uprooting tree line. The slide, Val Hollen said, “Made a terrible noise when the compression shock hit the house.” No humans were home at the time of the slide and no one was hurt. Elke the German Shepherd was immediately rescued from inside the home, visibly shaken but OK. The mud, rocks, and debris came to rest with enough force to cause windows to shatter. “Short term there is a lot of rallying around. Most of the assistance that is out there – Red Cross has been awesome – is immediate. Do you need a blanket? Do you need a roof over your head?” Now it’s not immediate anymore; the medium and long term is the problem. “We’re staring down the next 6 months to a year. It’s very scary. Two weeks in a friend’s guest bedroom is not the same as six or eight months – you won’t be friends at the end of it.” And there’s nothing out there for rental housing, she finds. “We want to be staying near the house to be keeping an eye on it properly.” But after a frustrating search in Boulder Creek, it looks like temporary accommodations will probably be in Scotts Valley while the couple tackles the requirements that will determine the fate of their property. Summertime’s simple pleasures are in abundance in the Santa Cruz Mountains. Time stretches long and luxurious, sun drenched days followed by clear starry nights which seem to last forever; shafts of light part morning mists with welcome warmth and the gentle urgency of things to do. Sumptuous tastes appeal: Small plates, fresh bounty from the garden, and hand-crafted wines from local slopes. Small vineyards tucked into quiet hillsides coax fruit from the vines, most notably Pinot Noir, Chardonnay and Cabernet Sauvignon. More than fifty wineries work their art in the Santa Cruz Mountains and invite the curious to sample. A Sunday drive along any of our sun-dappled mountain byways will take you to the doorstep of earthly sensation and connection to the mountains themselves. At a recent winemaker’s dinner at Casa Nostra, Ben Lomond’s piping hot spot for well coddled Italian fare, assistant winemaker at Bargetto Winery, Bobby Graviano, spent his 28th birthday introducing enthusiasts to sensational pairings featuring some of the winery’s most popular pours. The 2014 Pinot Grigio, “with hints of bright grapefruit, sweet pear, and apple,” paired with bruschetta verde and crostini rock shrimp with pesto. A 2014 Pinot Noir, “bright and fruit forward with rich cherry, currant, rosemary, and cedar” paired with penne Contadina, onion, mushroom, rosemary, chicken, and tomato in a light cream sauce. Bargetto’s 2012 Merlot reserve, grown in the Santa Cruz Mountains, complimented the filet mignon, potatoes, and green beans “with the aromas of black licorice, cherry, and black currants with a lingering hint of vanilla spice and oak.” And the dark chocolate mousse danced on the tongue with the 2012 Lodi old vine Zin while the birthday song was sung. 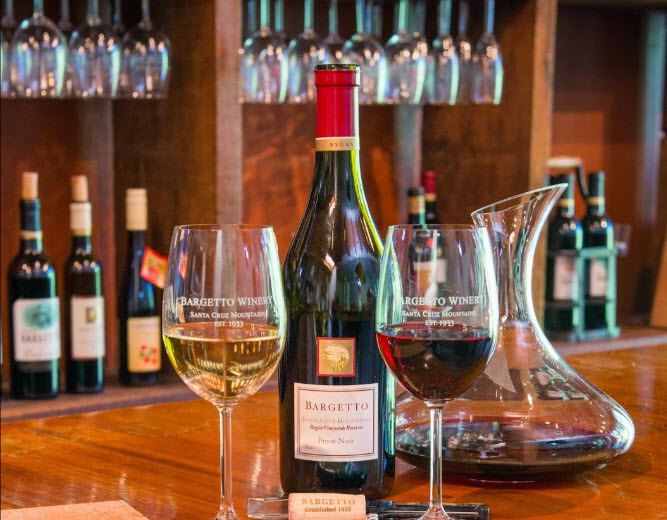 Bargetto Winery, located in Soquel, began producing wine in the Santa Cruz Mountains in 1933. Known for estate grown varietals, Pinot Noir, Merlot, Pinot Grigio, and Chardonnay, the flavors rich and intense, the third-generation Bargetto family still lives on the property to carry on the tradition. The oldest winery in Santa Cruz County, the craft itself has been handed down to upcoming young artists, Santa Cruz winemaker Olivia Teutschel, and assistant winemaker, Bobby Graviano, imparting a youthful freshness of spirit to the making. The tasting room is easy to find on North Main Street nearer to town than expected. Bobby took me on a tour of the cellars where the wine is aged, depending on variety and point in the process, in temperature-controlled stainless steel tanks and 60 gallon barrels made from French, American, and Hungarian oak. Bobby graduated from the Cal Poly wine and viticulture program and told me that wine making “sounded like a cool major.” His favorite moments in wine making are spent in the cellars and the lab attending to the finer art of the science of it, monitoring the fermentation process, pH, and sugars. He is proud of Bargetto’s four tiers of Pinot, the lightest of all the reds, which grow best in Santa Cruz Mountains cooler climate and “won’t leave you puckered.” He also noted Bargetto’s unique flagship wine, La Vita (“the life” in Italian), which blends three estate grown northern Italian red varietals, Dolcetto, Nebbiolo and Refosco. The bottle label features a different local artist each year with proceeds going to a new charity annually. He says Bargetto is a smaller winery, producing less than 50,000 cases a year, and they bottle on-premises, a unique distinction. 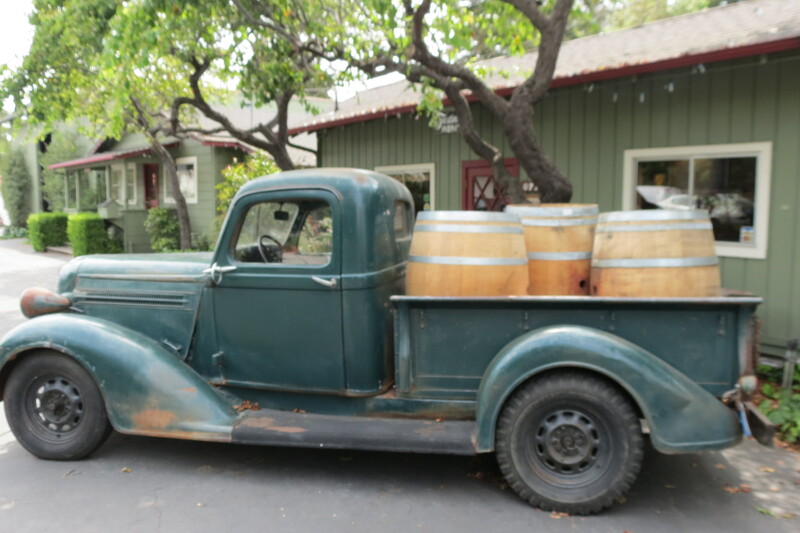 He loves “the great atmosphere and great people” at the winery with live music nights and special events in the tasting room and on the patio overlooking Soquel creek. Locals have been going there for decades. “It’s been around forever. I talk to people my parent’s age and they say, ‘I used to go to that place back in the 70s!’” Some wines are sold only in the tasting rooms, like the Petite Sirah and the blends, which are made in limited quantity. Other specialties, like Chaucer’s fruit wines and honey mead, a traditionally sweet sip that harkens to Medieval England, are available in local markets and nationwide. 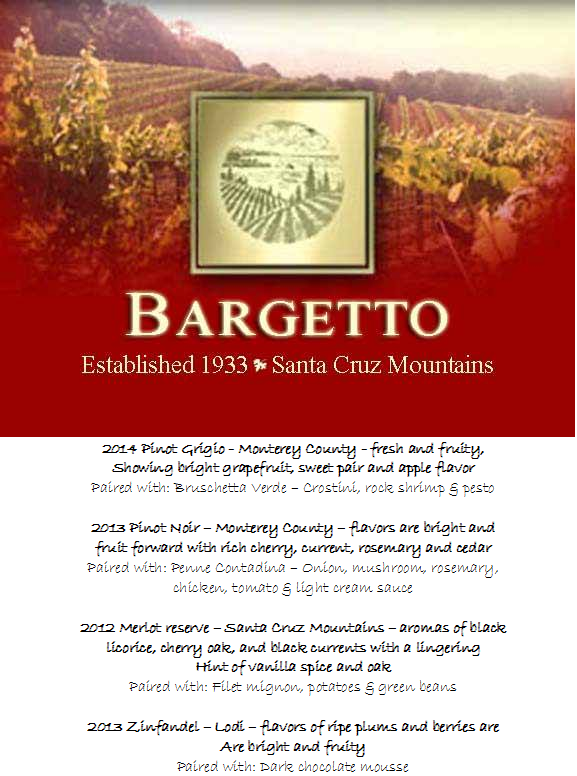 Look for Bargetto Winery at The Scotts Valley Art, Wine and Beer Festival at Sky Park on Saturday August 15, 2015.